'Star Wars: Leia: Princess of Alderaan' review: A flawlessly written in-depth view of Leia's introduction to the Rebel Alliance – AiPT! A tale about the emergence of a little girl to the prominence of a rebel leader. 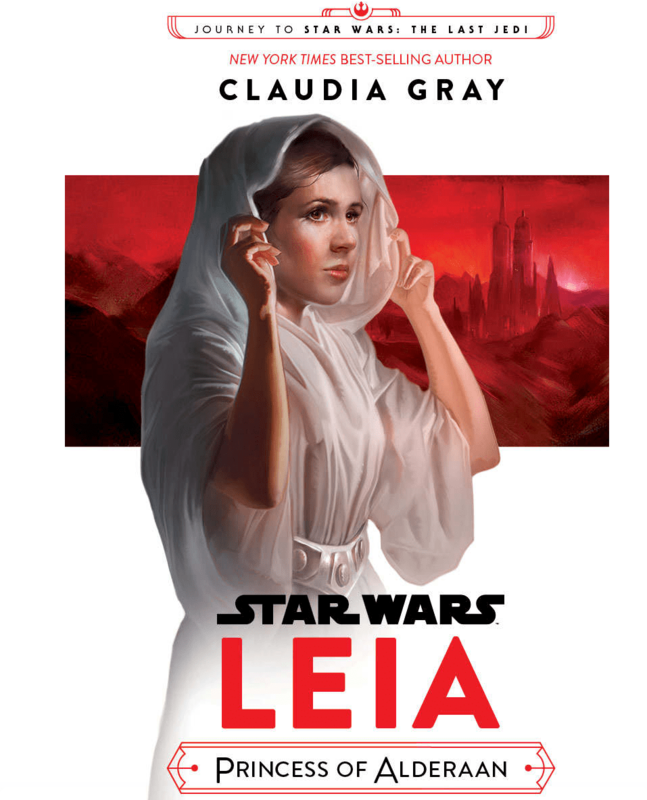 Released in September as part of the Journey to The Last Jedi media push, Leia: Princess of Alderaan is a YA novel geared towards younger Star Wars readers. However, like many of the YA Star Wars novels released since the canon reboot, this book is more for an older-teenage-to-adult aged audience. This book is written by Claudia Gray, whose previous entries in the franchise, Lost Stars and Bloodline, are some of the best canon novels that have been released to date. Lost Stars alone is one of the best Star Wars novels ever, and it was also marketed as a YA novel. So, how does Gray’s third Star Wars novel fare? Leia: Princess of Alderaan starts three years before the events of A New Hope, on Leia’s 16th birthday. Or at least what she knows of as her birthday. The novel progresses several months during the course of the story but never leaves that particular year. Most of the previous YA books spanned many years, becoming background stories for characters that we know, or meet, on screen in later movies. Leia, though, spends almost all of its time around one central event: Leia’s introduction to and eventual joining of the Rebel Alliance. The premise of the novel is that on Leia’s 16th birthday she presents herself on her Day of Demand to the rulers of the planet Alderaan (mom and dad), demanding her right to the crown. After that she needs to perform several tasks in order to prove herself worthy. These include the Challenges of the Mind, Body, and Heart. It is through these tasks that she will prove herself a competent ruler for the people of Alderaan. For the Challenge of the Mind, Leia joins a group of young senators-in-training called the Apprentice Legislature. Many members of this group become prominent characters in the story and one is even an important character later in The Last Jedi. For the Challenge of the Body, Leia plans to climb a summit on Alderaan, and to do that she gets training in a “Pathfinding” class, which is basically boot camp. Most of the primary Apprentice Legislature characters are in this class as well, helping the reader to get to know them quite a bit. And the last task, the Challenge of the Heart, is where Leia performs humanitarian efforts across the galaxy. It is with these humanitarian efforts where many of Leia’s efforts in the novel begin to fail. And she fails a lot throughout the novel. It’s actually surprisingly refreshing. Normally, I would expect the main character of a story, especially a character as famous as Leia, to power through. Sure, she would hit some bumps in the road, but nothing major. Here, she is not only hitting bumps, she is majorly screwing up plans that Bail has laid down for work in the Rebel Alliance, although we don’t know that yet. And it is with her first mission to Wobani, where Leia screws up months of work, that we start to get to see the inner workings of the Rebel Alliance. The story is told from Leia’s point of view though, so no matter how much the reader probably can assume, we still don’t know everything because Leia doesn’t know that much yet. It’s one of those stories where the audience knows what’s going on and we get to witness it slowly being revealed to Leia. One of the major strengths of this story is Leia’s interactions with her adoptive parents. I don’t recall ever actually seeing Leia interact with Bail before and Breha is barely even in any canon material — she is essentially non-existent. Leia makes them not only fleshed out characters, but characters we can love, and it makes the destruction of Alderaan all that much more of a gut punch. From my perspective, this is because we lost Breha, who is truly an astounding character. Leia is having a rough time throughout the story; her parents are absent from her life because they are working for the Rebellion, but she doesn’t know that. All she feels is this ever-widening gulf. As a father of a little girl, I feel hers and their pain. I understand what it’s like to want to protect your children and how you get angry at times when they do things that make sense to them at the time, but is bad that they did it. I get all that, and it hurts to read but I love it and I love Bail and Breha more than I ever did before. Of the fellow Apprentice Legislature pupils, most of them fade into the background. There are two primary ones though. Probably the most important one is our connection to The Last Jedi, Amilyn Holdo. And if Leia’s relationship with her parents was a bright spot of the novel, Holdo is a beam of light. She is fantastic! I love her. She comes across as a ditz, but she is genuinely a good person and one that by the end of the story, mostly makes sense (she’s a bit of an enigma). She was portrayed as the Luna Lovegood of Star Warsand I can totally see that. The other main character is Kier, who I could personally not care much less about. He is another Alderaanian and set up as the “love interest” of the story. But mainly, throughout the story I constantly wondered his fate. Was he going to survive the book just to get blown up? Or was there some other surprise in store? That was pretty much about how much care I had for him. I just didn’t like him. He felt like a weak character and I never saw the connection that he had with Leia, or even any of the other characters. I ended up listening to this book as an audiobook and the quality of the audio is fantastic (as I would have presumed). The narrator, Saskia Maarkeveld, sounded so much like Leia at times that I would hire her to do voice acting for the character. Her male voices were sometimes a bit husky and often they blended together but her Leia makes it all worth it. Gray’s writing style helps the audiobook as well. She is flawless and is able to draw the reader in with just a few sentences and keep the reader engaged the entire time. Overall, this was another home run for Gray. It’s not quite as good as Lost Stars, which I personally feel was as close to a 10 as any Star Wars book can get, but this is still a very solid book. There are several stand out scenes of the book, including when Leia is in the Naboo system (the best part of the book), a scene where there is a possible crossover with Lost Stars, and a possible crossover scene with the upcoming Solo: A Star Wars Story movie. The story eventually comes back around from the beginning to tie up every plot thread in the book in a nice little bow. I was actually amazed how certain plot elements that were seeded earlier actually came back. The best part of the book though, is the character depth you get for Leia and her parents. It just makes sense. A tale about the emergence of a little girl to the prominence of a rebel leader. I would put this as one of the best books of last year easily. Overall, this was another home run for Gray. It's not quite as good as Lost Stars, which I personally feel was as close to a 10 as any Star Wars book can get, but this is still a very solid book.